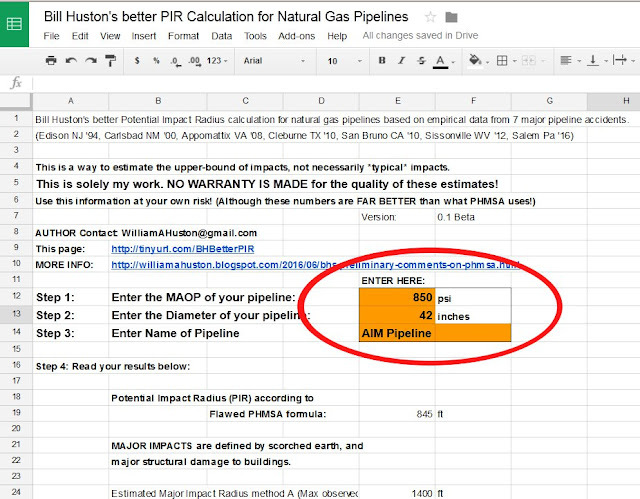 to estimate impacts from the failure of natural gas pipelines. http://williamahuston.blogspot.com/2016/06/bhs-preliminary-comments-on-phmsa.html (although there is probably room for improvement). natural gas pipeline impacts, based on my research. So I created this online tool. Just enter 3 items into the orange boxes. and the name of the pipeline. AIM pipeline. 850 psig MAOP, 42" Diameter. After you do that, scroll down to see the calculations. 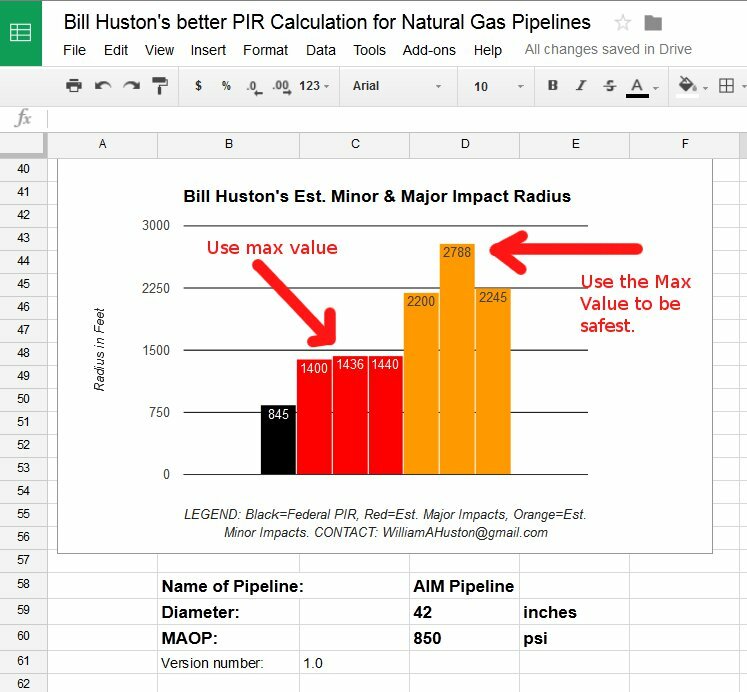 I give 2 overall values: Estimated Major Impact Radius, and Estimated Minor Impact Radius. I define "Major Impacts" as scorched earth, and major structural damage. This is the "incineration zone", complete loss of property and life. I define "Minor Impacts" as anything which could warrant an insurance claim, such as warped or melted siding. At the end, you get a nice graphic with a summary for your pipeline. The BLACK bar is the predicted PIR using the flawed existing formula. The RED is my estimate of Major Impact Radius (incineration zone). The ORANGE is my estimate of the Minor Impact Radius. I use 3 methods to calculate each. I would suggest using the max value for both the Red and Orange columns. So this shows the PREDICTED PIR for the AIM pipeline is 845'ft. However, according to my calculations, a better estimate for the upper bound of MAJOR impacts (incineration zone, complete destruction) is 1440 feet, and an upper bound for minor impacts (heat flux, melted siding) is 2788'ft. This is my idea of an Upper Bound which should never be exceed. If I every find an accident with larger impacts, then I alter my formula. These are NOT typical impacts. This is meant to represent a worst-case scenario with special factors which contribute to impacts, such as a) long burn time, b) wet gas, c) presence of fuel/accelerants such as trees, homes, chemicals, or roads, d) topography (hills/valleys), e) weather conditions, etc. NOTE WELL that I have NO DATA for any pipeline failures greater than 36". So if you are dealing with a 42" pipeline, understand that my numbers may be low (but still should be more realistic than with the PHMSA formula).